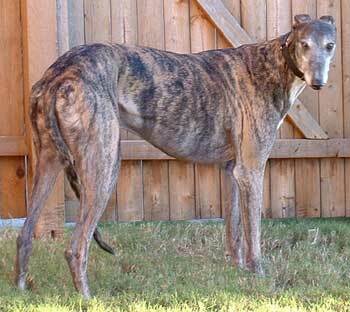 Frankie, aka KB's Zeppelin, is a strikingly handsome dark brindle 5-year-old male born November 1998. 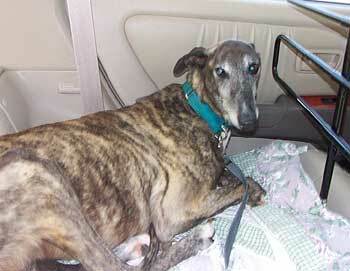 Frankie came to GALT with a lot of medical problems, the worst being heartworm positive. He has completed his lengthly, costly treatment and is now ready to find his forever home. Frankie is skittish and uncertain about people until he gets to know you. He does well with other dogs and is cat trainable. 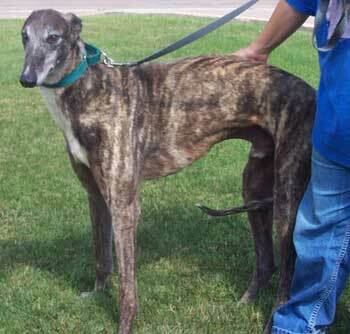 Frankie's story is one of GALT's most dramatic rescues. Frankie likes to gather things and he will play tug with the rope toy we have, but only with me. He likes to test people out by walking quickly past them - I call it a fly-by. I think he is testing to see if there will be any aggression towards him. He will do this over and over until he starts to trust you. If you let Frankie stay in his crate, he will, and that is when he will bark at you. He just does this because he is scared. If I go and call him out he comes right out of his crate and is fine. He needs a home with a lot of love and patience. 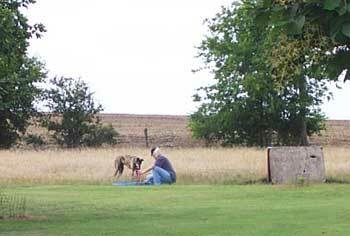 Frankie, like many greyhounds, has angels watching over him - several masquerading as humans. On a cold Texas day his first angel, Dianna Baker, looked out her frost-covered window and saw what looked like a large dog in her pasture. 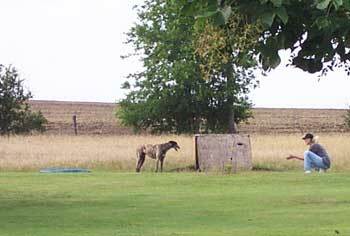 When she investigated, she saw in the distance a starved, frightened greyhound with pleading eyes. She and her husband, Mike, who live outside Hillsboro, began bringing food to him twice a day, moving the bowl a little closer each day until they had him in the back pasture behind their house. While obviously grateful for their kindness, Frankie was too traumatized to come close enough to be touched. Throughout the spring, Dianna and Mike unselfishly cared for Frankie even though he was still too frightened to touch. They built him a small shelter and when hot weather arrived, they bought him a little swimming pool to stave off the Texas heat. They began to look for a rescue organization to try to catch Frankie and take him into their organization. 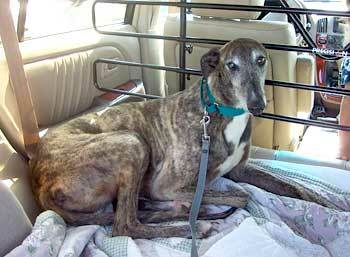 On June 22, 2003, GALT received a call from a greyhound adoption group in San Antonio that had been contacted by Dianna. 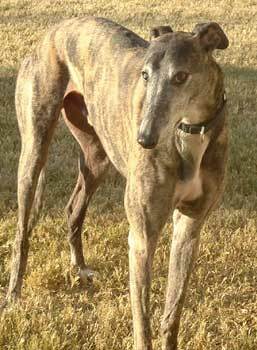 To help with the situation, GALT contacted Mary McAnally, who in turn called Bonnie Fix, a greyhound friend, who lives close by in Hillsboro. Bonnie came over and verified he was in fact a greyhound and offered to help coordinate Frankie's capture. 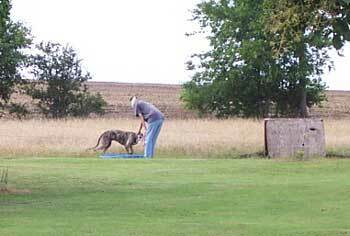 On June 25, 2003, two of GALT's volunteers, Ty Lawrence and Buffy Milner, drove to Hillsboro to try to help catch Frankie and bring him back to Dallas. Dr. Jeff Ellis had prescribed "doggy Valium" to put into his first feeding of the morning, which would hopefully slow him down enough to catch. They put the tranquilizer in his food, and Frankie ate. The wait began. They waited and waited. and hours passed. The temperature went higher and higher. Frankie had other ideas. Frankie was still on his feet. The four angels cajoled, whispered, begged and ultimately almost cried as Frankie circled just out of reach of human hands. The only one who could even get close to Frankie was Dianna. He seemed sleepy but when he laid down, he still watched warily, jumping up at the smallest movement of the volunteers. Finally the volunteers called it a day and started back for Dallas. It was on the road back to Dallas, stinging from the failure, that Frankie got his name - in honor of the main character in the movie, "Catch Me If You Can." Shortly after Mike came home that evening, Frankie's days of living in the wild came to an end as he triggered the crate door while eating his dinner in the crate set up earlier in the day. Mike had cleverly buried in the food a rope that was tied to the crate door. And bang - Frankie was caught! After spending the night (in a crate) at Bonnie's house, Buffy and Ty came back to Hillsboro and picked up the elusive Frankie. Although skittish, Frankie enjoyed laying on the soft comforter and finally allowed his rescuers to stroke and pet him. He submitted quickly to human care and it was thought that at one time he may have experienced being with a family. Thanks to a regular diet, he had filled out nicely but his coat was thick and rough, his nails were over an inch long and curled, and his smell was not of sweet perfume. His right eye is 80% opaque as the result of a prior injury, and it is not known how much he can see out of that eye. Even so, Frankie is a beautiful five-year-old honey brindle. Frankie, now identified as KB's Zeppelin, will need not only a lot of love and reassurance, but some expensive medical treatment. Frankie is heartworm positive, but has no tick diseases. Hopefully he will begin treatment during the week of July 7. His progress will be updated periodically. He is now in a very quiet, loving foster home with Rita Greer, where he is receiving lots of love and special care. With time, (and lots of love, food and a soft place to lay) Frankie should learn that hunger is a thing of the past and that humans can be trusted. Someone out there has the forever home for Frankie. Frankie is cat and small animal trainable. Frankie has undergone the first phase of his Heartworm Treatment and so far is tolerating the treatment well. He is being cared for by his foster mom, Rita, with the utmost loving care. Frankie's follow up for the second phase of his heartworm treatment is about two weeks from now. He continues to stay quiet under the watchful eye of his foster mom. He is responding to living in a home well, and is particularly curious about that other dog in the mirror! Frankie had his dental and neuter on 9/10/03, and is doing just fine. His foster mom has written the following comments about "life with Frankie!" Frankie now loves to go for walks. If I go out the front door for any reason, he comes to wait for my return. If I pick up the leash we use for walking, he gets excited and runs to the door. If I don't get ready fast enough, he runs from the front door to the back door and back again until I shape up. This is quite a change from the scared boy who wouldn't leave my 60-foot-wide lot. I'm not kidding, he would go as far as the neighbor's driveway on either side and just stop. And when Frankie stops, he just stops. You can't budge him. Inside the house or when in the back yard, Frankie will come to me when called. When we go outside, he will usually keep looking back over his shoulder to make sure I am still there. Sometimes he seems more interested in nuzzling me than in doing his business. I just can't tell you what a change this is from the "ghost dog" that originally cowered in my darkened kitchen, and had to be lead into and out of his crate on a short leash! Frankie still likes to be crated. This is a big plus as far as I am concerned, because it will make adjustment to a new home easier. He hasn't bothered anything on the kitchen counter, or chewed anything or knocked anything over. Of course he is still carefully supervised, so that is no guarantee he won't misbehave if left to his own judgment. Frankie likes to sleep late in the morning, unless something wakes him up. We take our last trip outside between midnight and one a.m., so that isn't surprising. He has always preferred to eat late in the day whether I put out fresh food in the morning or just leave dry food in the dish. He is eating dry food quite well now. He will eat starting at about five p.m. and through the evening. For a working owner, an evening main feeding would work well. His coat is now beautiful and shiny and he truly is a beautiful, handsome, boy. Frankie still barks at strangers from time to time, but he is much less sensitive. He still has a bit of the watch dog in him, and I find this to be a desirable trait because his bark is so imposing. In a single family home, such as mine, he barks if someone comes into the front yard, or passes in front of the windows. He doesn't bark hysterically or run around, he just lets them know he is here and aware. As a single woman, I think it's greyt. He is docile and calm. He has consistently permitted me to care for him (brushing, ear cleaning, nail clipping) even when he refused to acknowledge my presence. He used to look right through me, and I couldn't even pull him toward me. The change in him has been really fantastic, and I believe he will eventually conquer his fear of people. I hope my comments prove useful. I am really impressed with Frankie's qualities as a pet. He gets along well with large dogs and is cat trainable. Frankie's heartworm test came back negative! Medical treatment a success!